'Pearce explores the personality of memory. Acknowledging its amazing range and various abilities, Pearce’s art explores memory and reconciles it with a recent and common ‘ancestor’ to us all: childhood. He strives to make visible the quirks and tragedies of our mind’s recording machinations, to materialize the emotional states that can cripple our bodies and which often distort the way we record time and memory. The nature of this internal landscape is of interest to Pearce; his sculptures may exist within his internal world but they also seek to co-exist as time-travellers in our own. Within Pearce’s work, internal spaces are visited sculpturally. Here memory is visualized, scrutinized and retold. Spirits and stories of past lives or of family history are bought forth from the dark inner recesses they once occupied to our current time and place. Several recent works, The Red Trike and Deadline have explored the metamorphic phenomenon as a metaphor for the shape shifting self that occupies the mind. Pearce creates sanctuaries in which memories can shelter from harm, loss and anonymity. Adapted, weathered and polished, these places seem more like manifestations of emotion rather than representations of the actual objects themselves. Dislocated, they allude to both survival and demise, creation and destruction. It is these notions of creation and destruction that interest Pearce sculpturally and this is reflected in the way he re-constructs his works after inflicting wilful damage upon them. He longs to bring sculpture closer to the practice of drawing; immediate, expressive and correctable. The idea in his work is that of dualism between the functions of mind and body. He feels that the body can retain the overflow of memory, storing unprocessed emotions in various areas, relieving the mind to gather its more receptive stimuli. Replacing organs such as ears and a brain with a plethora of rocks suggests these may have been magically turned to stone by a spell or curse or, alternatively, that they could be suggestive of a particular state of mind. In the work Cavern No.1 (2009), a corridor-like portal emerges from (or retracts into) the corner of a room engulfing the messy and recently vacated space within its walls; at once seemingly inviting, it is also oddly aggressive. 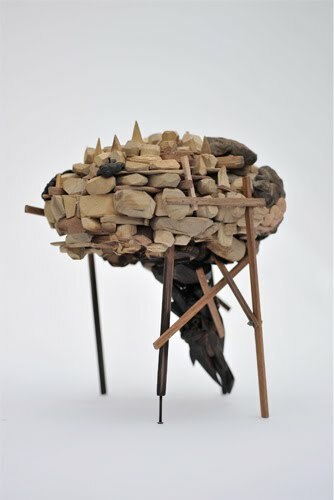 Where rocks feature in Curse (2009) and Cavern No.1, they are stacked precariously as if a totem for worship or occupation, an occupation where they can only be tenant to themselves and their consciousness. Pearce’s works seem scarred or defunct of use, purpose and sometimes beauty, existing in an undefined space that is both grotesque and eloquent. Pearce’s works are nearly always parasitical in some way, inasmuch as they are forms which deem it necessary to clasp on to found objects: from trikes or chairs to re-made everyday objects and sometimes even the spaces they find themselves resting in, anything, it seems, is fair game.